The accommadation at River Island can vary depending on your own individual lifestyle, taste and budget. 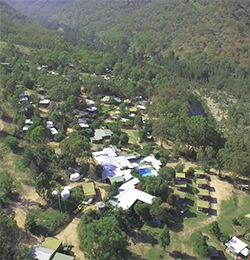 From family sized luxury cedar cabins overlooking the valley to grassed camp sites along the Wollondilly river, there is something to suit everyone. Our Cedar cabins include a fully equipped modern kitchen, family room, bedroom, bathroom with twin showers, covered verandah complete with table and chairs, and a barbecue area. Caravans include a fully equipped kitchen, bedroom and a covered verandah, complete with table and chairs. Camping sites abound throughout River Island. All are grassed and many sites are sheltered under large trees. Sites are available near the main complex and along the riverside. Longing for an outlet to plug in a hairdryer (Hmmm)? Or possibly just a level site to park your own caravan and enable the lights! Either way, there are plenty of powered camping sites available to suit your needs.